Have you ever seen a person from afar and immediately start making all these over the top assumptions about them? Oh look at her, with that style and those looks she probably is high class young woman. Have you heard her voice? Such a sweet and refined sound, could only come from a demure lady right? That was actually my first impression of Kaede when I first saw her only to discover that while yes she is a fairly classy lady she is quite an odd fish. At the time I really didn't know all that much about any of the Cinderella Girls. At best at that point time of time I might have read the first few chapters of the New Generations manga. I don't recall if she was introduced or not since for whatever reason the author of that manga decided to bombard the reader with dozens of characters introductions from the get go. It wouldn't really be until later that I would I see a colored illustration and notice Kaede's heterochromia and her beauty mark. I later learned that she was voiced by delightful Hayami Saori as well. These all combine to give me that image of an elegant, graceful lady, something along the lines of Takane from the 765 Pro girls. As I began to consume more of the supplementary material and fan works I began to quickly learn that while I was correct that she was an nice, elegant lady, much like Takane, she has quite a bit of quirks. What are some of those quirks you ask? For starters there is her love of puns that just makes you wanna facepalm sometimes. A pun here and there is fun but sometimes I feel Kaede just goes a little too far. :D Then there is her apparent love of drinking, whatever recreational activities I had in mind for her going down to a pub for a drink was definitely not one of them. 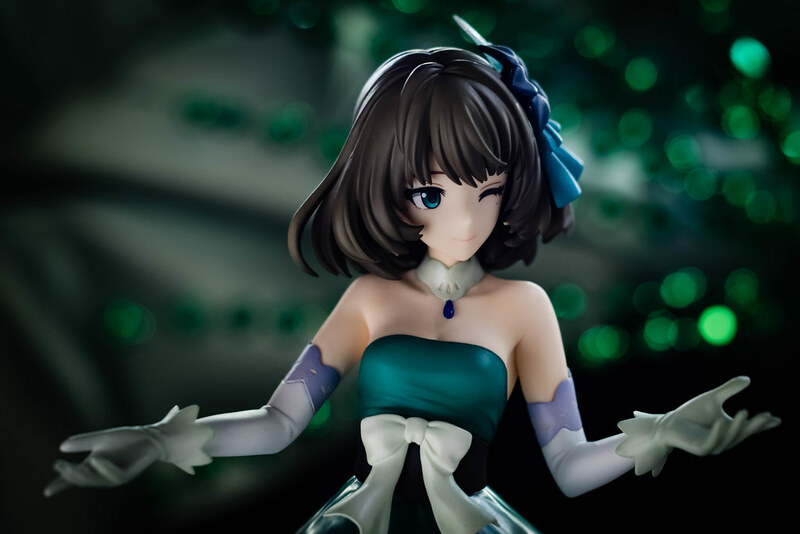 Was I disappointed that Kaede didn't quite match my initial impression of her? Quite on the contrary in fact, this just made me genuinely like her. Who doesn't like a companion with a good sense of humor? Who doesn't like a girl who can go out a have a a bit of fun at a pub or bar? The more I read, the more I illustrations I saw, the more I liked her. I was quite very much looking forward to her appearance in the anime. I was quite glad she actually showed up quite early! 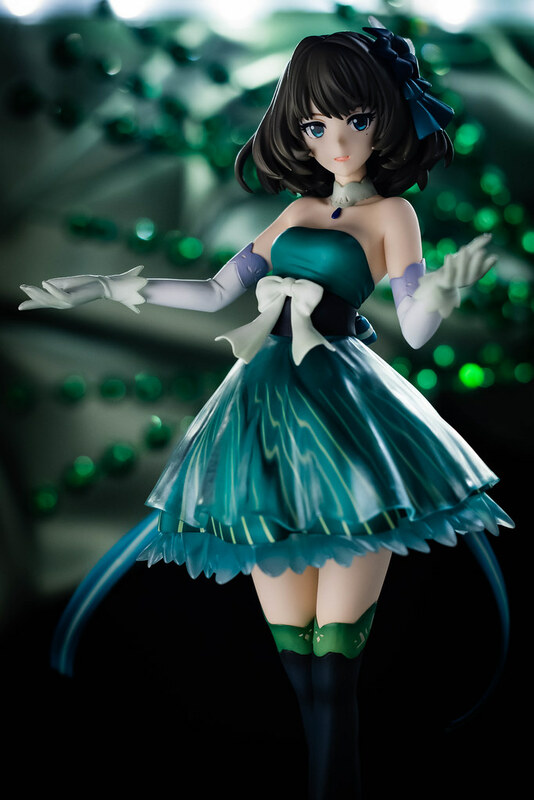 Then I was quickly disappointed when I learned that she was instead a supporting character rather than part of the main Cinderella Project crew. Luckily for me she had her day in the limelight during the second half of the show. That episode showcased her wonderful personality, her love of puns and her love for a good drink. Much like myself at first the girls had a bit of shock to learn her personality clashed a bit with her image! That episode also showed a sublime rendition of Kaede's wonderful image song Koi Kaze, listening to that song just gave me chills. Not only is Kaede a beautiful young woman, has a great sense of humor, and fun to hang out with, she is also a talented songstress! God, I wanna marry her! 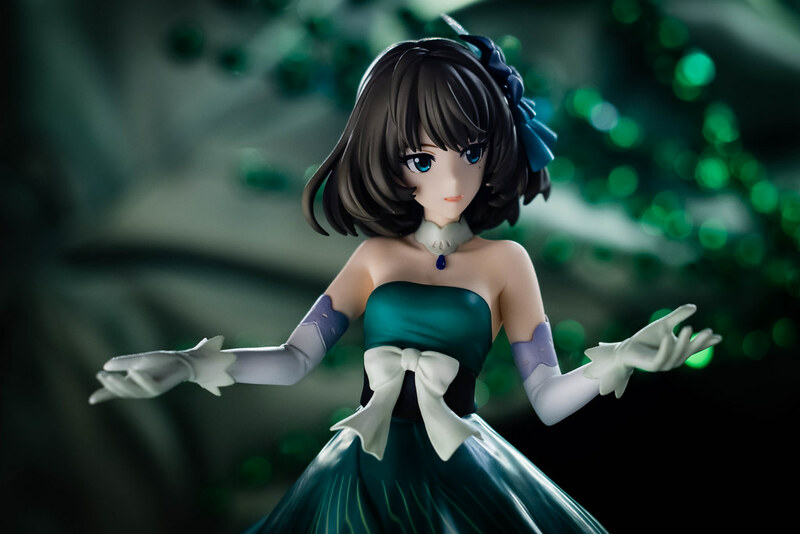 Which leads us to this figure, for a long a while I wanted a nice scaled figure of Kaede but I had little luck aside from garage kits. 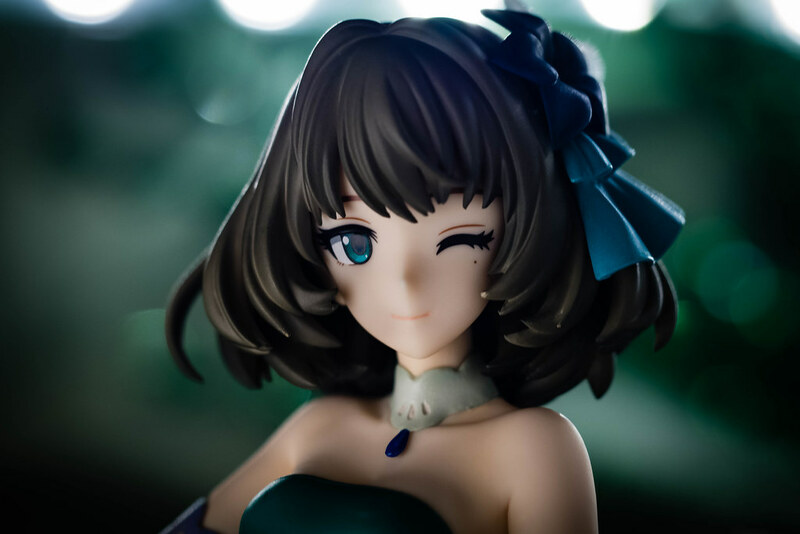 Luckily for everyone that is a fan of anything Cinderella Girls the show brought some much needed exposure and even more popularity and thus merchandise followed. 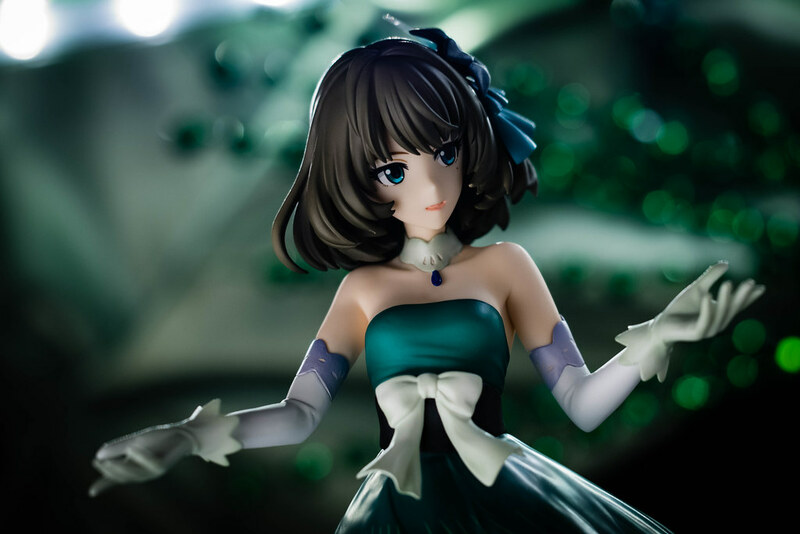 This is where Kotobukiya comes in with this gorgeous looking Takagaki Kaede - Hajimari no Basho scaled figure! 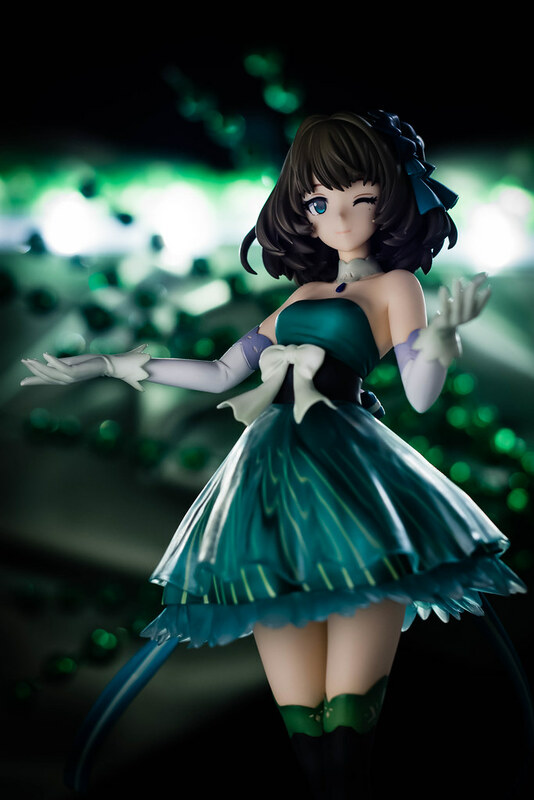 When it came to Kaede I essentially wanted one of two figures, one where it showed her as the quirky girl she is and one that shows her as the graceful songstress that lives up to the Cinderella monicker. 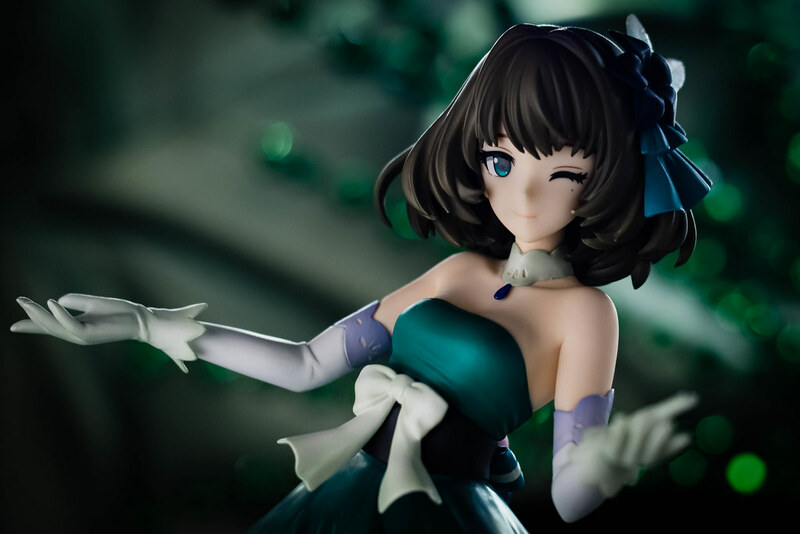 Koto has opted for the latter and showcases her as she appeared during her performance in the second half of the show. They have done a stellar job in that front. Her dress looks spot on and contains many small details that are pleasing to the eye. The folds of her skirt, the creases in her dress and the fluttering ribbons all come together to show a perfect sense of motion. I can easily picture in my mind as if she had just turned towards the camera as the photo was taken. 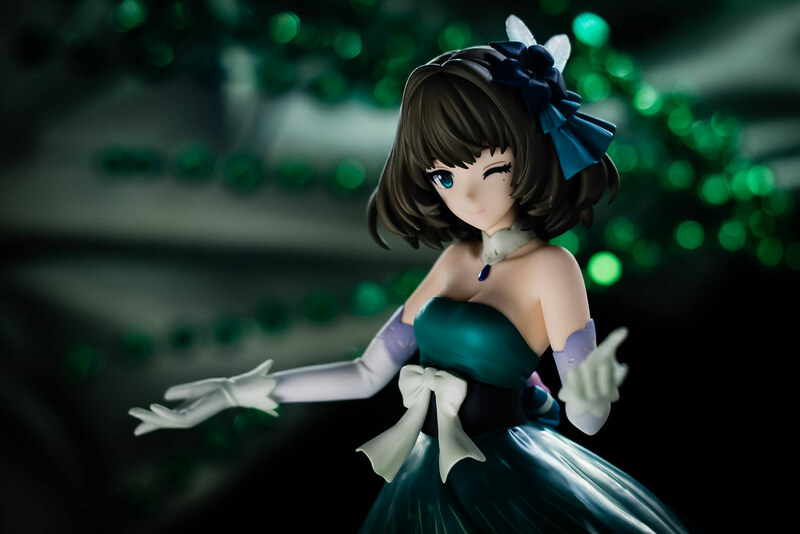 Kaede's stage outfit contains plenty of delicate details such as the lace in her gloves, her choker containing a small pendant or the translucent skirt. Upon a bit of closer inspection the details might seem a bit rough but this only when looking through the macro lens. When looked upon with the naked eye everything looks quite nice. 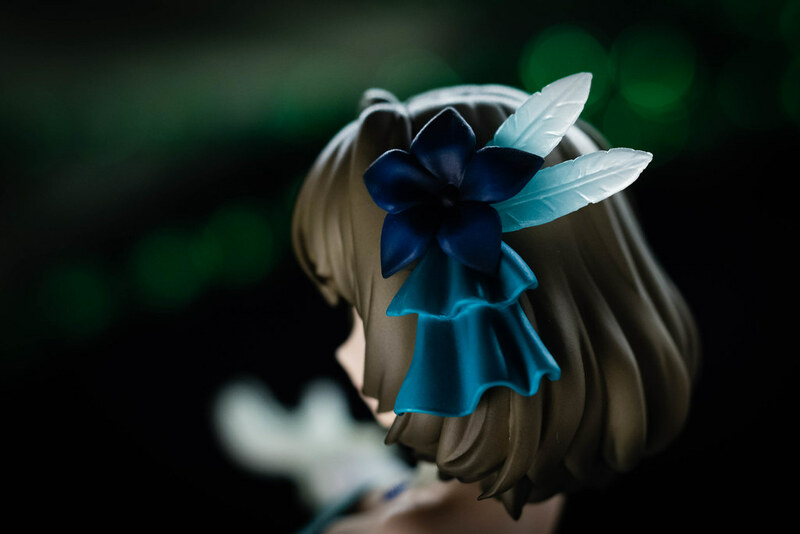 Her beautiful fluffy hair is adorned with a pretty headdress consisting of a flower, headdress and feathers. The gradient colors and the translucent feathers are my favorite part. 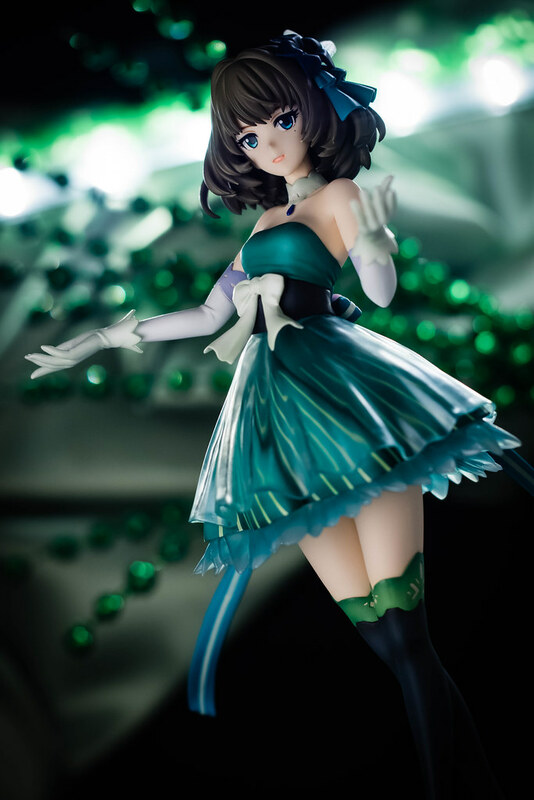 Kaede's sumptuous legs are adorned with thigh high sporting similar design as her gloves and a pretty pair of green high heels. 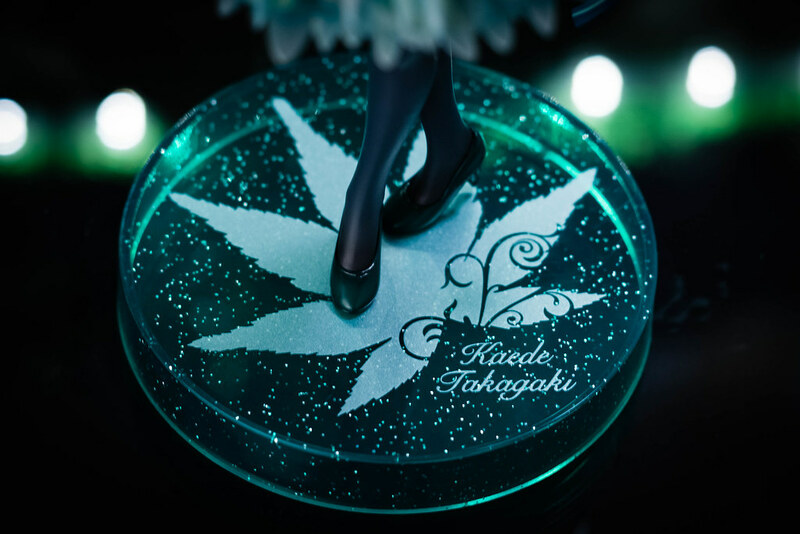 The base of the figure is of a simple circular design, adorned with her namesake maple leaf, Kaede's name and glittery specs. 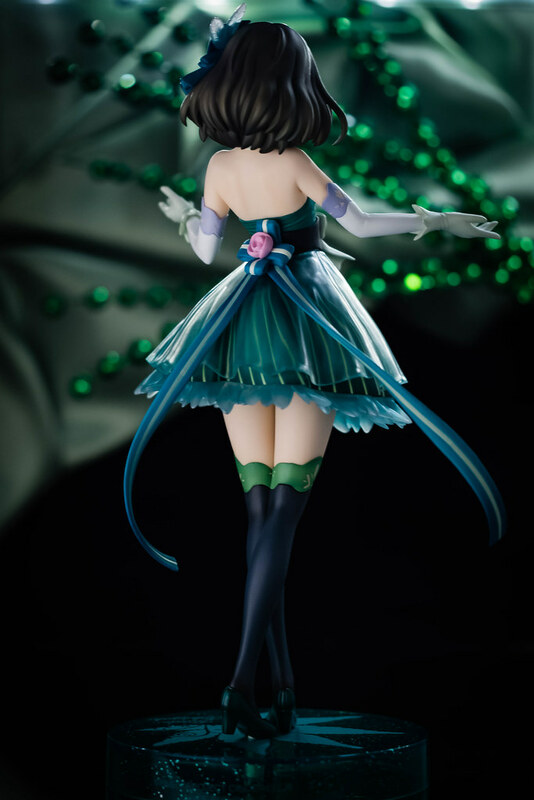 If you turn around you can see her luscious back, you can see some well defined shoulder blades giving that sense of authenticity to her body figure. 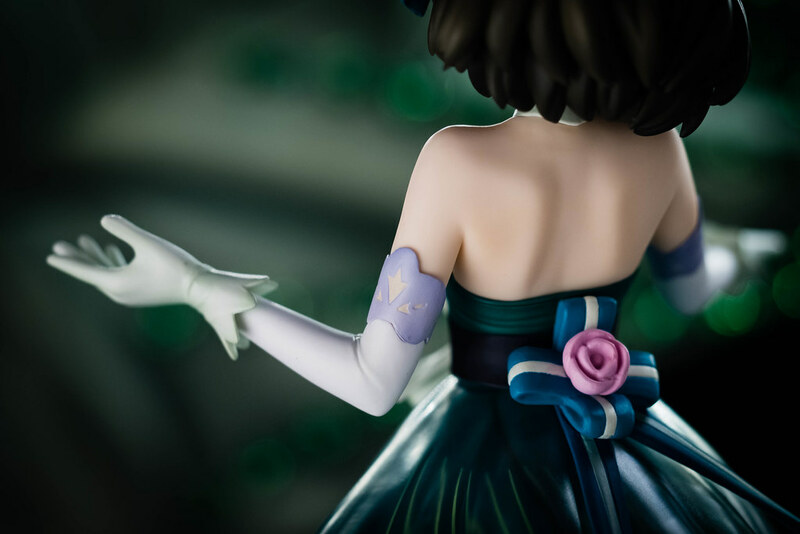 You can also see the ribbon that adorns the back of her dress with a rose ornament. 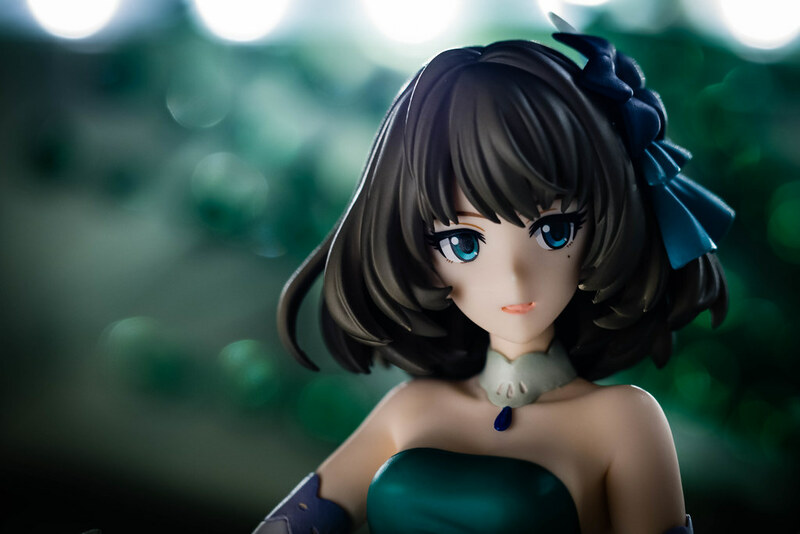 If you glance upon Kaede's dazzling face you can gaze into her eyes and notice the aforementioned green and blue colored almond shaped eyes. In addition to that her beauty mark lives up to its name and is easily visible and alluring. I love her calm and regal expression, fitting that part of her image quite well. 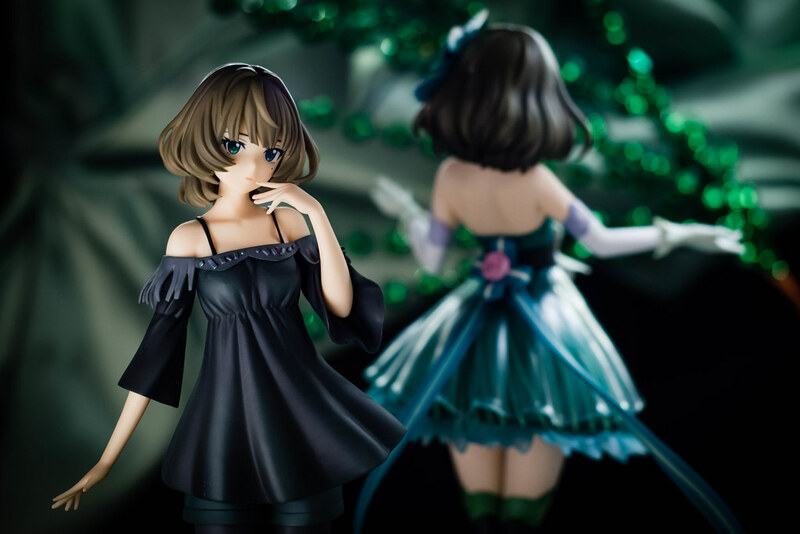 Since having shop exclusive bonuses is all the rage nowadays for figures Koto didn't want to miss on the action. 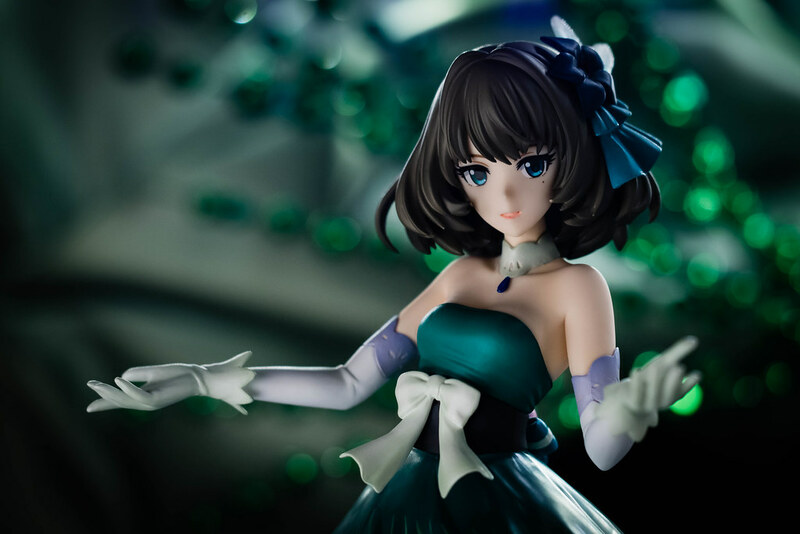 If you ordered Kaede from the Japanese Kotobukiya shop a second, alternate expression was included. 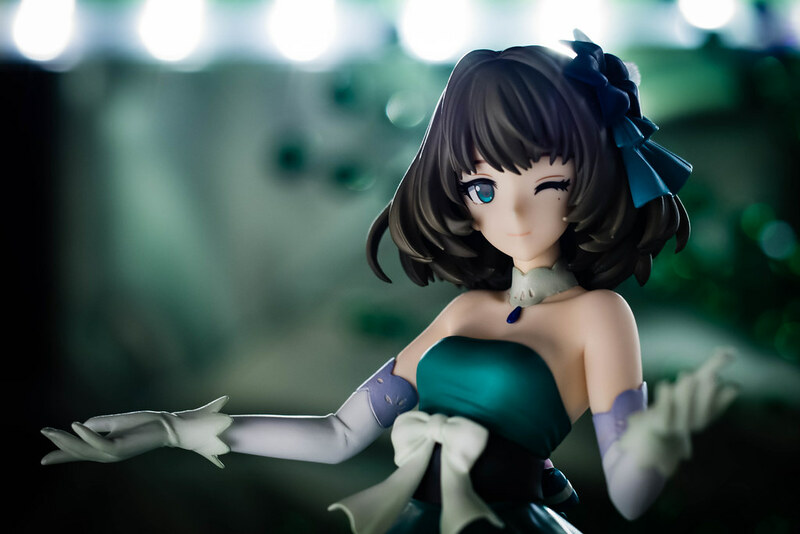 I just love Kaede's playful winking, I can just imagine her having just cracked a pun at the audience in good jest. Worth every extra penny and the trouble of having to go through a proxy to get it! 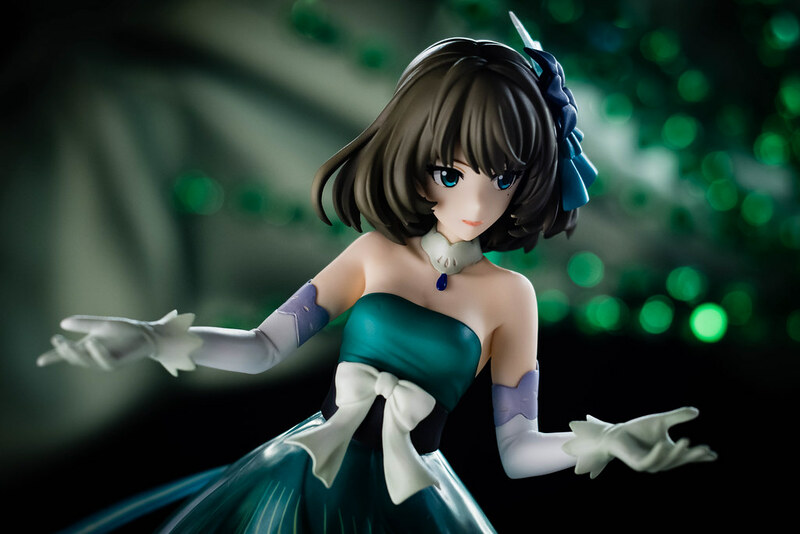 Overall I'm very satisfied with Kotobukiya's work, I feel they have done a great job showcasing Kaede's majestic form. 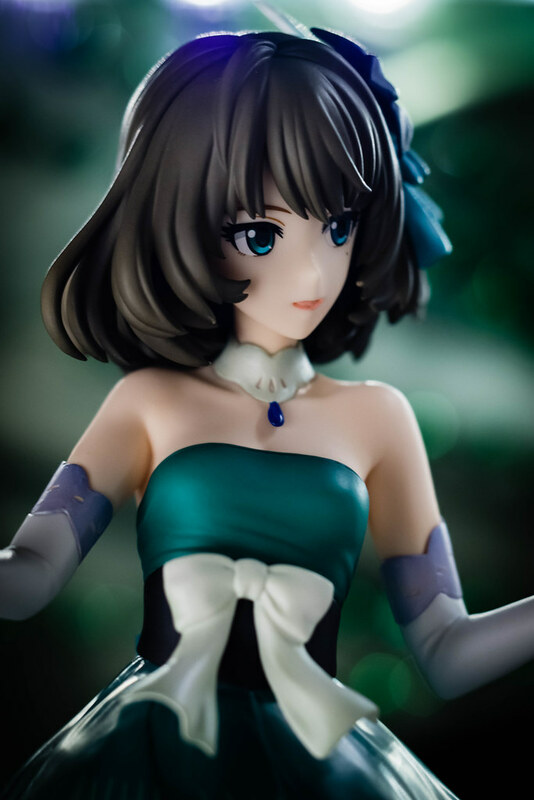 In addition to Wave's casual clothes version I'm quite satisfied with in terms of Kaede figures. I don't feel the need to buy more. 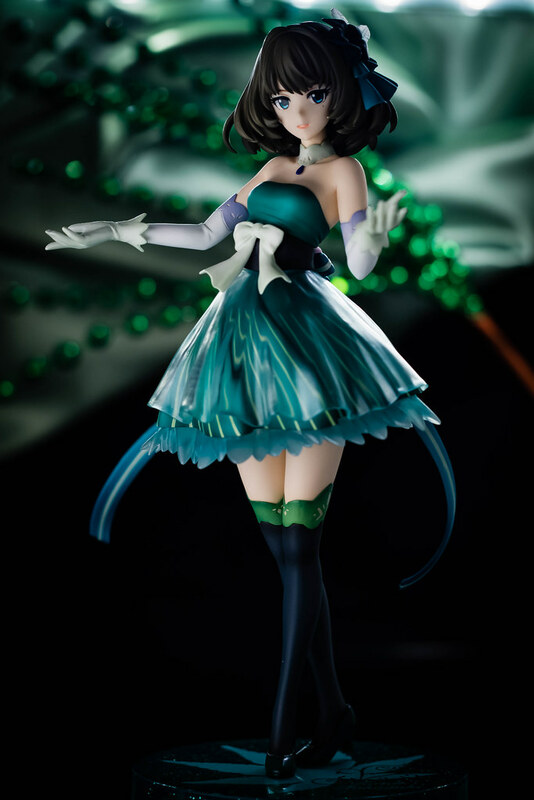 Ah hold on, there is that other figure from Wave. 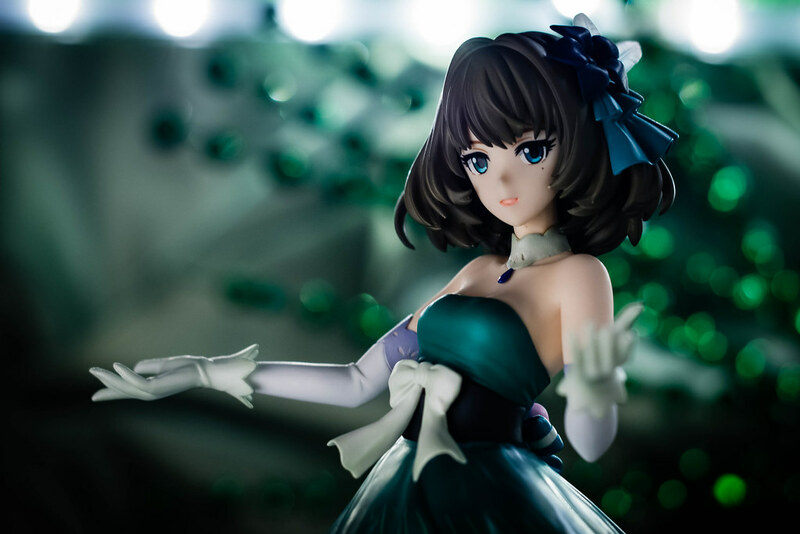 Once I buy that one I will be totally satisfied with Kaede figures... probably! Until next peeps, see ya at the pub!